The City of Port Isabel will kick off the 2018 holiday season with their 11th Annual Community Christmas Tree Lighting Ceremony. On Saturday, December 1st at 7:00 p.m., Beulah Lee Park will once again be the site for the Christmas Tree Lighting Ceremony. The event will feature live performances by school groups from Garriga and Derry Elementary Schools and the Port Isabel High School. Vendors will be selling festive foods and drinks. Vendors will be open at 6:00 p.m. The public is invited to come together with the community for this holiday tradition. Also on December 1, for the second year is a Holiday Parade. The theme for the parade is “Hometown Christmas”. Staging for the parade will take place at 4:30 p.m. in front of The Laguna Madre Youth Center on Port Road. The parade will begin at 6:00 p.m. 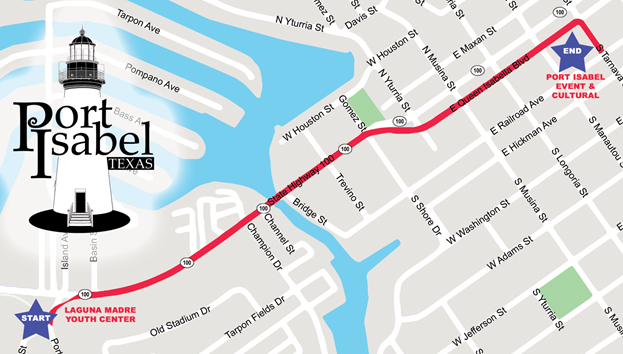 The parade route will head east on Queen Isabella Blvd. (Hwy 100) and end at the Port Isabel Events & Cultural Center. Parade applications must be in by Friday, November 23, 2018. Any application received after Friday, November 23, will be inserted at the end of the parade line-up in the order it is received. A $25.00 Entry Fee is required for all Political and Commercial Floats. No application fee is required for Non-profits and Schools. Parade line up begins at 4:30 p.m., and the parade begins at 6:00 p.m. Cash prizes for 1st, 2nd and 3rd place overall. Winners are announced later that evening at the Annual Community Tree Lighting in Beulah Lee Park. Winners not attending can pick up their prizes at the Port Isabel City Hall the following day. Applications can be mailed to 305 E. Maxan Street, Port Isabel, TX 78578, emailed to salcocer@copitx.com or faxed to (956)943-2029. Applications can also be dropped off at the Port Isabel City Hall (305 E. Maxan Street). For more information call (956)943-2682 or email citysecretary@copitx.com.